Shen/Zhao are the first pair from China to become World Champions. They have been skating together since 1992. 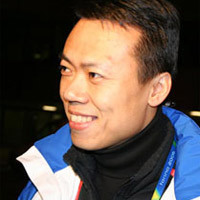 Both started as single skaters and Shen was paired with Zhao when his former partner retired. They name 1988 and 1994 Olympic Champions Gordeeva/Grinkov as their idols in skating. Shen/Zhao have landed quadruple throw Salchows in practice. The couple withdrew from the 2005 Four Continents Championships as Zhao suffered from a foot injury. Coach Yao Bin was on the first team that represented China in a World Championship (Dortmund 1980). He skated pairs with Luan Bo. They finished in 15th place.